So, fellow nerds, what's with this video circulating on Facebook and Youtube? First of all, these are not spiders. They are harvestmen or daddy-longlegs. For those of you who remember the ol' mnemonic device for taxonomy, King Philip Can Order Fresh Green Salad (Kingdom, Phylum, Class, Order, Family, Genus and Species), these critters, like spiders, scorpions and ticks, are in the class Arachnida. However, harvestmen belong to their own order, Opiliones. Harvestmen have a single cephalothorax and a single pair of eyes. True spiders have a narrow "waist" that creates two segments, the cephalothorax and abdomen. Harvestmen have a single pair of eyes. True spiders most commonly have eight eyes, however they can have no eyes, or as many as 12 eyes. Harvestmen have no spinnerets, so they do not spin webs. Harvestmen are older than spiders--the oldest fossil, from Scotland, is at least 400 million years old. True spiders are about 300 million years old. Harvestmen are omnivores--they eat dead stuff, bird droppings, fungus and small arthropods and slugs. Finally, the question every one is asking. WHY DO THEY DO THIS? They mass for defensive purposes, and to keep themselves warm. Harvestmen possess a pair of stinky glands called ozopores; when they mass, the combined smell can be quite disturbing. Swarming also makes them appear larger. When disturbed, the entire throng will sometimes bob and sway--a truly unsettling effect. 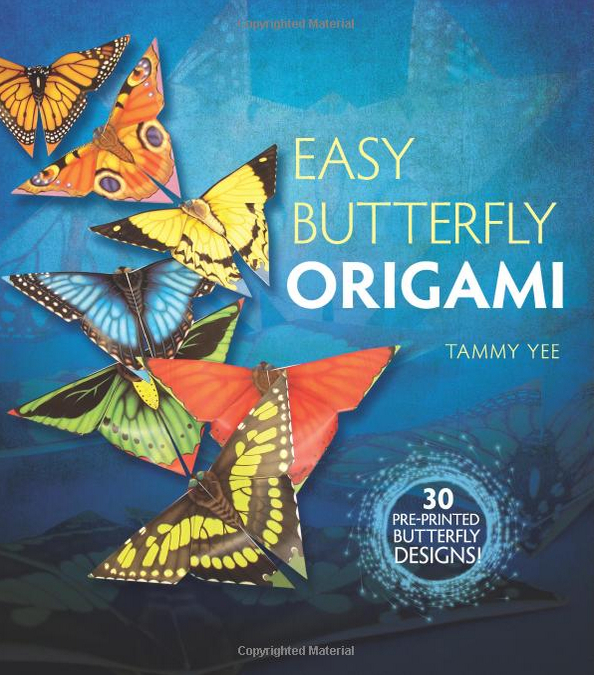 Video step-by-step directions for folding patterns from my new book, "Easy Butterfly Origami" featuring 30 bold full-color patterns designed to accurately portray the dorsal and ventral sides of some of the most beautiful butterflies from around the world! Fun facts about behavior and distribution accompany each butterfly model! From the vivid green Cairns Birdwing to the striped Tiger Swallowtail and the Blood Red Glider, these beautiful butterflies feature a kaleidoscopic array of colors and patterns. Includes simple instructions for folding, and perforated pages for easy removal. Many butterflies have iridescent patterns on the top, and drab undersides for camouflage while they rest with their wings folded up. The origami patterns in this book are specially designed to highlight the diversity of species--when folded, the models accurately portray the variation in the insects' top and bottom views. Each butterfly model is accompanied by fun facts about behavior and distribution. For example, did you know that the Mountain Alcon Blue butterfly tricks ants into feeding and protecting its caterpillars? Other caterpillars, like the Moth Butterfly, are carnivorous and feed on ant larvae and pupae. The 68th Annual Friends of the Library Book Sale starts this weekend on Saturday, June 20, and Sunday, June 21 at McKinley High School! Authors and illustrators from SCBWI (Society of Children's Book Writers and Illustrators) will be selling and signing their brand new children's books and art work in the blue tent in front of the the cafeteria. A portion of sales will be going to support Friends of the Library of Hawaii. 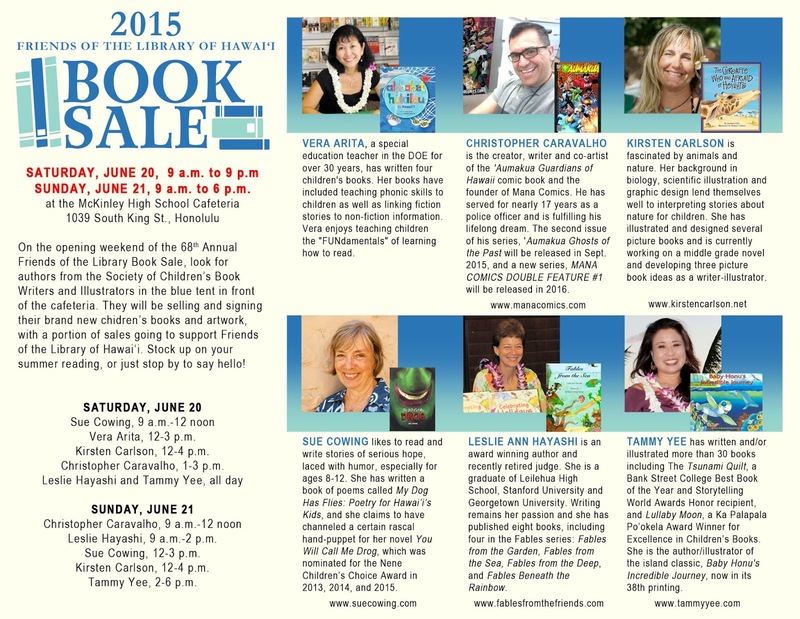 The FLH Book Sale is an island tradition that attracts over 20,000 readers of all ages and backgrounds and features bargains and a selection of titles to rival any bookstore. Stock up on your summer reading, or just stop by to say hello!